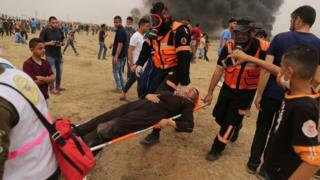 Palestinian health officials say more than 100 Palestinians have been killed and 10,000 injured by Israeli troops over the past six weeks at a series of protests along the border between the Gaza Strip and Israel. Sixty died on Monday alone, when 40,000 took part in demonstrations that coincided with the controversial relocation to Jerusalem of the US embassy. Palestinian President Mahmoud Abbas accused Israel's military of carrying out "massacres" of unarmed civilians, but Israel's Prime Minister Benjamin Netanyahu insisted its troops acted in self-defence and blamed the militant group Hamas, which dominates Gaza, for the deaths. What has happened at the protests? Hamas and other groups organised the protest campaign, dubbed the "Great March of Return", in support of the declared right of Palestinian refugees to return to land they or their ancestors fled from or were forced to leave in the war which followed Israel's founding in 1948. The Israeli government, which has long ruled out any right of return, said terrorists wanted to use the protests as cover to cross into its territory and carry out attacks. Before the protests began, Israeli officials said soldiers would be permitted under certain rules to fire live ammunition at anyone attempting to damage the border fence, and even against people coming within 300m (985ft) of it - a figure that was reportedly later reduced to 100m. Despite the warnings, thousands of Palestinians approached the fence during the protests. A number threw stones and Molotov cocktails at Israeli soldiers deployed on the Israeli side of the border, and flew kites laden with petrol soaked material intended to start fires on Israeli territory. Israeli troops responded by firing tear gas, rubber bullets and various types of live ammunition. What do human rights groups say? They have accused the Israeli military of using excessive force. They have said Israeli soldiers deployed near the Gaza protests were required to operate according to the international legal framework applicable to police and other law enforcement officials, which is part of international human rights law. It holds that the "intentional lethal use of firearms may only be made when strictly unavoidable in order to protect life". "An attempt to approach or crossing or damaging the fence do not amount to a threat to life or serious injury and are not sufficient grounds for the use of live ammunition," Rupert Colville, a spokesman for the UN High Commissioner for Human Rights, told reporters on Tuesday. "This is also the case with regards to stones and Molotov cocktails being thrown from a distance at well-protected security forces located behind defensive positions." Philip Luther, Amnesty International's Middle East director, said: "This is a violation of international standards, with Israeli forces in some instances committing what appear to be wilful killings constituting war crimes." Last month, the group documented witness testimony, video and photographic evidence that it said showed Israeli troops were killing and maiming demonstrators who posed no imminent threat to them. The Israeli human rights group B'Tselem said the open-fire orders were "manifestly unlawful" and called on Israeli soldiers in the field to refuse to comply with them. Last month, six other human rights groups asked the Israeli Supreme Court to revoke the military's rules of engagement that they said permitted live fire at protesters classified as "key agitators" even when they did not pose an immediate threat to life. The groups said soldiers should instead follow the law enforcement framework. The court's decision is pending. Lawyers for the Israeli government argued before the Supreme Court that the military's rules of engagement along the Gaza border were "in keeping with Israeli and international law". They asserted that the demonstrations along the border were "part of the armed conflict between the Hamas terrorist organisation and Israel". The military's open-fire orders, they said, were therefore subject to international humanitarian law - also known as the law of armed conflict - rather than international human rights law. Mr Netanyahu said on Monday that Hamas, which has fought three wars with Israel since 2008, had declared that "it intends to destroy Israel and sends thousands to breach the border fence in order to achieve this goal". "We will continue to act with determination to protect our sovereignty and citizens." The Israeli military has insisted that its troops have acted "according to standard operating procedures" when confronting Palestinians "partaking in violent riots". "We resort to live fire only when absolutely necessary and when there is clear threat to infrastructure or to Israeli soldiers. If there is, then we use snipers who fire specifically and under very clear guidance by commanders," spokesman Col Jonathan Conricus said last month. The military has said it also foiled a number of "terrorist attacks" orchestrated by Hamas during the protests and killed people trying to plant bombs at the fence or break through it. On Tuesday, the military said it had evidence that at least 24 of the 60 people reported killed the previous day were "terrorists with documented terror background", including many "active Hamas operatives". Senior Hamas official Salah Bardawil said in a TV interview the following day that 50 out of those killed on Monday were "from Hamas and 12 were ordinary people". But he did not elaborate and Hamas spokesman Fawzi Barhoum later declined to confirm whether all 50 were members of the group. Why is the legal framework so important? Noam Lubell, a professor of international law at the University of Essex, said human rights law required a graduated approach to the use of force - starting with no force, on to minimal force, and reaching lethal force only in the context of imminent threats to life. The law of armed conflict, he added, contained a different set of rules, some of which could allow in certain circumstances for direct recourse to lethal force against particular individuals, including combatants in wars and civilians directly participating in hostilities. However, it does not entitle security forces to open fire on civilians if they are only demonstrating. Professor Lubell said that if the Israeli military was operating under the armed conflict model along the Gaza border, then it might argue it was only targeting individuals taking a direct part in hostilities. But he added: "There would still need to be legal scrutiny to see how they have interpreted taking a direct part in hostilities - was it construed to include only individuals attempting to use weapons or explosives, or was it anyone coming near the fence? The latter would seem too broad of an interpretation to allow for direct lethal force." And even if the law of armed conflict was applicable in this situation, while it might allow for lethal force against members of armed groups operating from within the crowd, as far as civilians taking part in a demonstration - including a "riot"- are concerned, the expectation is still that any force used towards them would be based on the law enforcement framework in international human rights law. Additionally, if the armed groups are using the civilian crowds for cover, that could in itself be a violation of international law on their part. However, even if that is the case, it does not remove the civilian protection from demonstrators entitled to it. Professor Lubell said there was also the question of whether, given that the protests did not come as a surprise, more could have been done by the Israeli military in advance to minimise the use of deadly force - something both international human rights law and the law of armed conflict require. These recent events also cannot be divorced from the larger picture of the situation in Gaza, which itself raises many legal questions with regard to who has the power and obligations to alleviate the humanitarian crisis in the territory.